Listen: they won't make it up in volume. There's an old story about a guy in retail. He's having a great day in his store, moving a lot of product, feeling very successful -- when his accountant comes up to him. The accountant is sweaty and panicked, and he grabs the guy's arm and says, "Listen, we're in real trouble! I just ran the numbers and you're going broke! Something's gotta change!" The guy looks around the room and sees a ton of salesmen and a ton of customers. His merchandise is flying off of the shelves. He turns back to his accountant and laughs, saying, "Are you kidding? Look at this place!" "See," says the accountant, "that's just the problem! I looked at the purchase orders, and you're selling product for less than you paid for it... everything you sell is actually costing you money. It would be better for your bottom line if you kicked everyone out and didn't sell a thing!" The guy just chuckles, shaking his head wisely. He claps the accountant on the back and winks. "Don't worry," he says. "We'll make it up in volume." In other words, Trump's team believes that he can win success in the White House the same way he won the office itself: by doubling down on their core supporters, over and over. They are applying this tactic across the board when it comes to both optics and legislation. Trump and his core team crafts messages meant for their base and delivers policies designed to please their base. As long as that core of ~35% of voters remains energetic and pleased, they're betting that they can be used to scare businesses and politicians into doing as the White House wishes, which will in turn allow Trump to scratch out even more policy victories. Unfortunately for him, they've had to rely a lot on optics. As it turns out, divisive and fact-free bloviating is not conducive to real statesmanship. Trump hasn't had any problems when it comes to leaving deals -- Paris accords, TPP, etc -- but actually crafting new ones... well, this stuff is hard. Trump has been president for 158 days and hasn't had any significant legislative or diplomatic achievements, for example. That will probably change, eventually -- there are 496 days left before midterm elections, after all, and that's a lot of time to get something significant passed -- but he is performing poorly by most measures. When asked about his accomplishments, it's hard to find anything significant beyond his nomination of Neil Gorsuch... and that should rightly be called the work of Mitch McConnell, not Donald J. Trump. There's no wall, there's a crippled Muslim ban, there's no infrastructure or jobs bill, and so on. But if you're wondering how to explain White House behavior, this is often the explanation. Why do they do so many things that seem broadly unpopular, foolish, or otherwise contrary to their own best interests? Well, they're trying to appeal to their base. Most presidents try to do this, of course, but they don't take this approach exclusively. In recent memory, every president has taken seriously the idea that they are the president of the entire country, and worked to unite the nation. This has always been mitigated by their desire to achieve their own agendas, but at a bare minimum each previous president has always given lip service to an ideal of bipartisan unity. Donald Trump is engaged in a bold and unusual experiment, devoting himself to policies, ideas, and rhetoric that are broadly unpopular in an attempt to govern with an impassioned minority. In many countries, this would be reason to fear, since a minority can only solidify its hold on power by attacking the institutions that express the will of the majority. But Trump has tried that, and they have been found unyielding. So he's trying to do other things. Antagonizing the press. Flouting conventions of civility and ethics. Brazenly discarding inconvenient realities. Attacking allies and encouraging autocrats. All brash and all dangerous, and all accompanied by a stream of state media that attempt to gaslight the public and redefine norms. And if it's all unpopular among the public, and if even his base is shrinking at the reality of what they've wrought? If every reckless action and feckless word sinks him deeper into the fever-heat embrace of his most fervent supporters? It's okay. They'll make it up in volume. Sure you will, Mr. President. Listen: be proud of America -- it's passing the test. The institutions of America are holding strong. We should be very proud. The founders of America spent a lot of time thinking about despotism. This makes sense, since they'd just spent years fighting a war to resist taxation without representation and foreign rule. They were so worried about the prospect of a future despot, in fact, that the first government they devised was a failure because it was too weak. The Articles of Confederation provided only for a Congress with strictly limited powers, and had no mechanism for allowing any individual to significantly accumulate influence. The states were treated as sovereign and independent countries joined together only for what seemed to be expediency's sake, despite the fact that everyone -- foreign and domestic -- now thought of America as a single country united by their shared conflict and common interests. Is it probable, that the President of the United States, limited as he is in power, and dependent on the will of the senate, in appointments to office, will either have the firmness or inclination to exercise his prerogative of a conditional control upon the proceedings of that body, however injurious they may be to the public welfare? It will be his interest to coincide with the views of the senate, and thus become the head of the aristocratic junto. The President of the United States would be an officer elected by the people for four years; the king of Great Britain is a perpetual and hereditary prince. The one would be amenable to personal punishment and disgrace; the person of the other is sacred and inviolable. The one would have a qualified negative upon the acts of the legislative body; the other has an absolute negative. The one would have a right to command the military and naval forces of the nation; the other, in addition to this right, possesses that of declaring war, and of raising and regulating fleets and armies by his own authority. The one would have a concurrent power with a branch of the legislature in the formation of treaties; the other is the sole possessor of the power of making treaties. The Federalist Papers spend some time on these sorts of matters because they were all keenly aware of the novelty of the great American experiment in democracy, as well as its vulnerability. The Revolution had been fought first in the name of American rights as British citizens, and then in the name of their natural rights as human beings. Even with the acknowledged problems with the Articles of Confederation, Americans feared a tyrant. Today, we have good reason to be grateful to the founders of our country for their foresight. Our country has come under grave threat, but it is holding fast. Our institutions are winning. There was the potential for real danger. Indeed, if we looked at the situation with our new president with naive eyes, we might have seen a despot in the making. A man with a known reputation for dishonesty and cruelty, flush with the support of unquestioning millions, bolstered by a craven and acquiescent Congress, hungry for power and prestige, untroubled by norms of decency, and ignorant of history? Who couldn't concoct visions of a grim future where he began to restrict press freedom, pushed through laws to punish dissent, and declared federally-administer martial law in the "disaster areas" of liberal cities? It was a crazy and far-fetched scenario, but was it any more crazy than the fact that this man had won the presidency in the first place? I never thought anything like that was going to happen -- hence the name of this blog -- but I always understood it. When it seems like there aren't any rules anymore, then even our darkest fears seem possible. But our country has stood strong, and we should be so proud of it. Much of our legislative branch, under the control of the Republicans, has used every tool and genius it could find to try to jam through as many clawbacks of progressive success as possible, as quickly as possible -- and has found poor success. Beyond several dozen deregulations from the last year of Obama's term, they have accomplished little. The signature policy item they have pushed for seven years, repeal of Obamacare, is now so incredibly unpopular in every single state that they're trying to sneak it through the Senate before anyone can read it -- and should they actually manage to pass it, they will be surprised to find that the dismal cannons of that single battlefield victory sound particularly desultory in the grim aftermath of a war they permanently lost seven years ago. And even though we're only in the fifth month of single-party rule, the president is under serious investigation in both houses of Congress for misdeeds. It can't be overstated how remarkable this is. Republicans will do a lot in the name of tax cuts, but not anything. The judicial branch has repeatedly slapped down offensively unconstitutional executive orders, writing opinions at times with visible contempt. Indeed, so far the Trump administration has barely won a single round in the long process of litigating the Muslim ban, losing in three districts at then three appeals courts. It's already heading to the Supreme Court, which will be deciding relatively soon whether or not to reverse the injunctions blocking the ban. But even if the Muslim ban is put in place in full, or the mere power to enact it is affirmed -- and that's completely unknown and probably less likely than a partial upholding of lower court findings -- the precedent has been firmly and concretely established that the executive branch's exercise of its powers is still subject to judicial review. Everyone still agrees on that. Even the executive branch, of which the president is the head, has pushed back on their own leader. There are numerous individuals serving in the Trump administration who are honorable and want to serve their country. I'd even say that describes the vast majority of them, actually. They will only go so far. Famously, former FBI Director James Comey resisted pressure from the president to shut down the investigation into former National Security Advisor Mike Flynn, of course. But many people might have missed, amidst the flood of news, the fact that Trump also asked Director of National Intelligence Dan Coats and CIA Director Mike Pompeo to intervene with Comey in March. Both men refused the president, and also refused to publicly state that he wasn't under investigation. These sorts of people will overlook a lot, but there's a limit. And adding to our government institutions, we have the private ones. Enough cannot be said about the press, which has proven itself vital. While their natural incentives of viewership and false equity led them to some dark places during the 2016 race, the press has been doing amazing work in its aftermath. There are almost daily revelations in the pages of The New York Times and The Washington Post, thanks to a relentless set of reporters that smell blood and Pulitzers in the water (plus an executive branch more focused on infighting than effectiveness). If Republican members of Congress weren't acutely aware that their constituents were paying close attention and were passionately interested in how they handled a rampaging and impulsive president, then they would not bother to do more than mouth a few empty platitudes of concern before returning to their agenda (although to be fair, that does describe a certain fraction). They'd spend no time at all on oversight or investigation. And if Democrats were acutely aware of their constituencies' feelings about the president or his plans, they wouldn't resist with quite so much diligence or doggedness. If the judicial branch didn't have the protection of the people on which to rely -- the knowledge that Americans ultimately simply would not stand for a president who tried to defy the law -- they could not handle the legal issues with a free hand. The courts don't need to fear men with guns because they know that for every soldier at the president's command, there are ten more who will stand up in defense of the rule of the principle that we are a nation of laws, not of men. If the executive branch was not aware that they are acting for posterity, both for their own in later years and that of future generations, they might not be so able to stand up to their own boss when they've needed to do so. These are men and women who want to be respected, admired, and honored for their contributions... and for most of them, that means far more than a bit more money or power. In the White House, there's one Steve Bannon, one Donald Trump, one Mike Pence. But there are a thousand Rod Rosensteins. A thousand Robert Muellers. A thousand James Comeys. Millions marched throughout America on the day after Inauguration Day. The Women's March was the largest protest in American history -- in fact, estimates have it as at least three times larger than the largest previous protest movements! More than one out of every hundred people in the country marched for a single cause on a single day! And millions more supported them, cheered them, drove them, or watched children for them. I don't know how you felt on November 12th: sad, shocked, hurt, scared? But I know how you should feel today: proud. Because our institutions have been put to the test, and so far they are passing. I am so proud to be an American in 2017, and you should be, too. Listen: the stories Trump supporters tell. The music from the telescreen stopped and a voice took over. Winston raised his head to listen. No bulletins from the front, however. It was merely a brief announcement from the Ministry of Plenty. In the preceding quarter, it appeared, the Tenth Three-Year Plan's quota for bootlaces had been over-fulfilled by 98 per cent. The following is a post by user SkillUpYTfrom The Donald, the forum for Trump supporters. I have not edited it. It had many thousands of votes of approval from supporters and had been pinned to the top of the forum -- this isn't something I cherrypicked. As a longtime reader of that forum, I can also offer my own assurances that these sorts of fever dreams are posted constantly. They rely on an absolute and unwavering faith in the brilliance of Donald Trump, as well as fairly impressive research skills -- but an utter lack of all serious in-depth knowledge about finance, government, or law enforcement. In this telling, there are enemies everywhere, and only the brilliant maneuvers and tweets of the president are going to save everyone. You want to know how people can support him or think he knows what he is doing? Here's how one person explains the Comey firing, the tweets, and everything. I thought this was a pretty good write up and summary of Comey and his history + some interesting perdictions so I decided to source it and repost. This was originally linked here by /u/shortadamlewis and sourced to Anon. I found another (much earlier) post about this here on a blog that credits a Facebook post. All I did was dig up some sources and sprinkled on some formatting. Comey is a snake. Don’t believe the lie that Trump’s “tweets” are not professional and have no strategic purpose. His tweets are 'weaponized' and deadly. This was not a violation of protocol, it was tactical. Notice how Prez Trump compartmentalized the strike and did not inform any of his White House “staff” to prevent leaks. Notice how he emasculated Comey and the swamp denizens by letting them know in a tweet that the Attorney General got information (surveillance “tapes” from the seizure of Comey’s office) to let Comey and his handlers know that Trump’s DOJ has the goods on them. This was a brilliant, strategic and totally imperative move at exactly the right time against horrible, evil and corrupt powers infesting our government. The swamp is on notice that the President is on to them, they are sweating bullets because their criminal games of corruption are being pursued and they know it. They are screaming and ranting because they are desperate denizens of the swamp who are beginning to realize they are roadkill. GIVE /u/jeremybryce SOME LOVE (he helped compile all of this data and he is an ULTRA BASED PEDE). Listen: Trump's unpopular, but when will that start to matter? 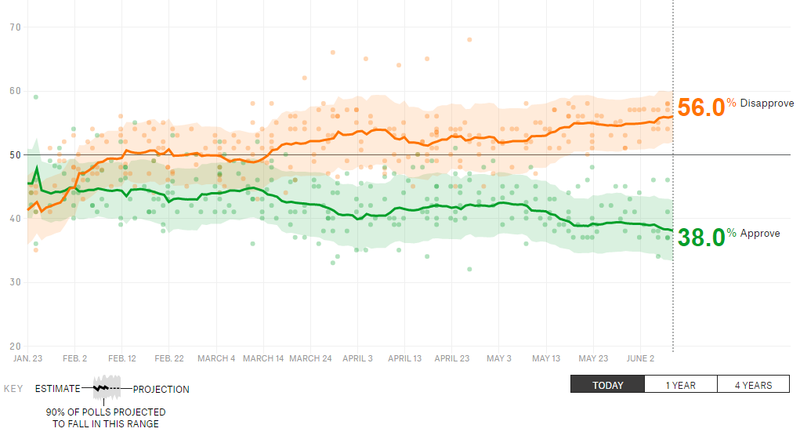 Below I have included a screenshot of the current state of President Donald J. Trump's approval and disapproval ratings among all voters, as aggregated and weighted by FiveThirtyEight. Notice that he began with about 44% approval (after a noisy few initial days that were all over the place), and that he has now dropped to 38% approval. That's a loss of a point per month. Other polling trackers generally agree: RealClearPolitics, HuffPo. Trump is losing support -- and those people that still support him are increasingly less enthusiastic about it, which is also important. Intensity of support is significant, and he has about half as many "strongly supports" as he once did. Is this likely to change? Could the trend reverse itself? Well, sure... but not spontaneously. He needs visible and real success: some major legislation that people like (they despise the AHCA), a big foreign policy victory, etc. Or he needs to dramatically change how he is conducting himself as president. Neither of those eventualities appears even remotely likely at this point, and the slow decline of Trump's numbers might make them even less likely. There is precedent for recovery. Clinton had terrible early numbers, and he ended up firing a bunch of people and doing a big reset. And Reagan went from 51% to 67% approval early in his term. But they learned and changed. Bitter and besieged septuagenarians who can't tolerate disagreement aren't ideally placed for personal growth. Plus, let's not forget that everything is pretty okay right now. We're in the middle of the longest economic recovery in American history, the number of uninsured is at record lows, there haven't been any major foreign policy disasters. Eventually something is going to go wrong! So while the future is an undiscovered country, I don't see Trump's numbers getting much better. But here's the thing... by and large, Republican legislators are sticking by him! With a few marginal excepts from people in unsafe seats, they excuse horrific misbehavior from the president, defend his crazy words, and agree to most things he wants. When is his unpopularity going to start to matter? To begin with, it's worth noting that it matters a lot already. The Republican-run House and Republican-run Senate are both engaged in active and intense investigation of the Trump campaign's ties to Russia, even if they've adopted the fig leaf of also purportedly investigating "improper unmasking" and other sops to the right. These investigations are being treated so seriously that the chair of House Intel, Devin Nunes, actually was forced to publicly step back from leading that inquiry once he began to appear too partisan. That's right: the Republican head of a committee had to publicly commit to giving up control of an investigation because it looked like he was too eager to help the Republican president. And we're only 134 days into the Trump presidency! He hasn't made it one half of one year yet! But okay, I know what you mean. Why do they keep defending the indefensible? The answer is very short: they want to get re-elected. It's not even "party over country," it's "myself over country." And it's kind of hard to even criticize them for that attitude. Yes, I know that we should demand and expect our legislators to act in their country's best interest above all. But in the view of many ideological Republicans, it's in the best interest of America for them to pass their legislative agenda. Tax cuts, slashing banking and environmental regulation, conservative Supreme Court justices, and reducing American international engagement are things that they think the country desperately needs, and so any damage that Trump does while they're passing those things... well, it's just worth it. Plus the more realpolitik commentator might point out that our constitutional system was designed for legislators to act selfishly for their own advancement. We should hope for better and fight for better, but not be surprised when we don't get it. As Madison said: "If men were angels, no government would be necessary. So when will they really start to break with Trump? Well, they'll probably turn on him when his antics threaten their agenda and/or their re-election. Right now, it's only marginal Republicans at risk: folks in seats that aren't solidly red. If Trump's numbers (which have a direct and large effect on generic Republican numbers) get down to 32%, then he's going to pose a threat to safe Republican seats. Then... well, they might need to recalibrate. Other possibilities might include Trump deciding to triangulate to the left, like Clinton did to the right, and threatening the GOP agenda. But that seems unlikely, if only because he doesn't seem to know or understand anything about policy -- so how could he make changes to it? And of course, I honestly do believe that most Republican legislators are patriots who care about America: if it comes down to it -- treason or something they cannot explain away -- many of them will indeed put their country above the interests of their party and themselves. Craven defenses of Trump notwithstanding, people like Kevin McCarthy or Paul Ryan do have their limits. Reversion to the partisan mean ensures that we're likely to see that Trump's numbers begin to slow in their decline. Can we guess when he might hit the Republican danger zone of 32%? Nothing major and headline-grabbing goes wrong in the country, Trump avoids big scandals, and he manages to get some decent things done. He shuts up a little bit more, maybe because Melania's presence calms him. So he loses approval at half the current rate: half a point per month. When does he hit 32%? One year from now, in June of 2018. In plenty of time for midterm elections. Oh, and then... well, if Democrats were able to get control of the House, they'd get subpoena power. They could subpoena internal memos, instructions to subordinates, the draft documents of the Muslim ban... Everything that lackluster Republican oversight is ignoring and the administration is hiding, the Democrats could demand and make public. There are five hundred and fourteen days left before midterm elections. Let's keep making them count, and keep dragging Trump's numbers down. The sails are set and the course is laid out... keep the helm steady and keep working. Listen: Bayes' Theorem and collusion with Russia. I'm on record as a skeptic about the possibility that Trump colluded with Russia during the campaign. I wrote that it just doesn't make any sense for Russia to collude with Trump at any high level, given Trump's instability and poor odds of success, and so "at absolute best, the Russia investigation will reveal an infiltration throughout the Trump campaign of Russophiles, plus an eager willingness on behalf of the campaign to capitalize on Russian hacking efforts." However, it has become clear that the administration is engaging in a frantic and insane cover-up that has involved a lot of unethical and probably some illegal behavior. The question then becomes: how much should this change our beliefs about the likelihood that the Trump campaign actually colluded with Russia? Shouldn't this just change my mind? No. I try to think in terms of probability, since very few things are ever 100% or 0% certain. Let's be Bayesian. We'll make an estimate of likelihood, then update it with new evidence. This post gets a little complicated about how it works, but I keep it as simple and clear as I can. You can skip to the end if you want to just see my conclusions without reading about the process. To start with, prior to recent revelations, where might we put the odds of direct collusion? Looking at the initial evidence, I would ordinarily say it was unlikely that any direct collusion took place, particularly with Trump's awareness. They certainly intervened to try to influence events by hacking both campaigns and selectively releasing Democratic secrets and emails in a deliberately damaging manner, and the Trump campaign delightedly embraced the help, but there was no evidence of collusion. There's a lot of circumstantial evidence, of course, such as the Trump administration's bizarre desire to assist Russia with things like sanctions and the president's unalloyed praise for the murderous autocrat that runs the place. But the Russian government mostly seems pretty competent, including people like Ambassador Kislyak, and they seem unlikely to take such a risk of exposure without a good chance of success. They're a petrostate, and sanctions have seriously hurt them; they will very much want to avoid more sanctions. The alternative explanation seems prima facie more likely and requires fewer additional assumptions, which is a virtue in terms of Occam's Razor: Trump, who has been publicly pro-Putin and pro-Russia for years, was simply more willing and open to accept personnel who were pro-Putin and pro-Russia. And in the same way, inexperienced Trump was also not quite up to the task of governing his subordinates in terms of appropriate contact, and lacked the experienced staff to make up the deficit. If you don't buy it, remember to think in terms of probabilities. For example, consider someone acting suspiciously and weird: if someone is loitering around a bank and acting really weird, it's possible that they're casing the joint and is planning a robbery. But most of the time, they're just hanging around for some other reason and acting weird about it. So considering the risky gamble for Russia that collusion for Trump would have been, and the more natural and intuitive alternative explanation (pro-Putin prejudice and incompetence), I would put the likelihood that Trump colluded with Russia at perhaps 5%. That is very unlikely indeed, but any estimate of a president colluding with a foreign power to win an election that arrives at one-in-twenty odds is still remarkable! Now we need to update our prior estimates with new evidence. Now, we might be tempted to just say, "Wow, that looks incredibly guilty, and anyone who does that probably did something wrong." But that's the wrong approach. When you get new evidence, it doesn't mean you discard everything you already knew or thought! You add this evidence, incorporating it into your whole view of the world. This is a big topic, but you can find a pretty good explanation of why this is important here and here. And Bayes' theorem is a great and simple tool for telling us how much new evidence should change our views. So if we had a group of people who are under suspicion for collusion, and who despite that kept meeting in secret with the people who they were accused of colluding with, and then also omitted that fact from mandatory disclosure forms, and then their leader repeatedly asked multiple officials (CIA Director Mike Pompeo, Director of National Intelligence Dan Coats, FBI Director James Comey) if they would please stop investigating, and then fired the guy who didn't seem inclined to obey... what is the likelihood that this group of people colluded with the foreign power? Again, this isn't the only information we have... this latest behavior is just the new information. So we shouldn't now say that we're 75% sure that Trump colluded with Russia. Let's use math to combine the new probability with our old probability. Probability of (collusion | given the appearance of cover-up) = [ Probability of (the appearance of cover-up | given collusion) plus the Probability of (collusion) ] all divided by the Probability of (the appearance of a cover-up). That fits pretty well with common sense. This suspicious behavior is really suspicious -- so suspicious it's quadrupled the odds of collusion! -- but it still seems pretty unlikely that the Trump campaign and Russia colluded on any high level. A 20% chance of that seems like a good assessment of where I think the evidence should put us. Now, do I sit down and actually do the math every time I think about stuff like this? No, not usually. I just try to adhere to a basic approach of adjusting my prior beliefs based on new evidence, and I try to keep perspective on any new evidence. Generally speaking, this helps me make better predictions and judgments -- not only because it's more honest about my level of certainty and knowledge on any particular topic, but also because it helps reduce my biases. If you "make up your mind" about something, deciding that it's "true" or "false" in a sweeping sense (100% or 0% likely to be true), then it's a lot harder to adapt to new information. Human beings tend to get "stuck" once they decide something, since it's hard to keep an open mind once you've reached a conclusion. So that's where I stand now, and that's what I think after this steady drip, drip of new revelations. I still think it's much more likely that all of this cover-up activity and incredibly suspicious behavior can be attributed to an inexperience and incompetent Russophile stocking his administration with like-minded people and little ethical oversight. But there's a decent chance -- one in five, in my best estimate -- that the current president's campaign worked to pervert the democratic process in concert with a foreign power. In the end, it's funny... it almost doesn't even matter. Right now, it's not the potential collusion that's brought President Trump to his lowest approval rating on record... it's the indisputable fact of a clumsy cover-up, even if it's motivated by poor judgment and panic. Ain't that always the way?